use a desktop or laptop computer with an up to date web browser (e.g., Chrome, Edge, Firefox, Safari etc.). 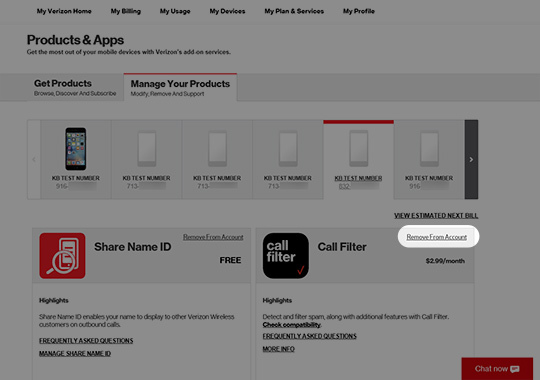 From the My Verizon Home screen, navigate: Plan > Add-ons. If you have multiple lines on your account, click the line you want to remove Call Filter from. From the 'Call Filter' section, click Remove from Account. From the confirmation pop-up, review the changes and bill impacts then click Remove Product. You can only remove a product from one line at a time.